BLUE CHRISTMAS ? 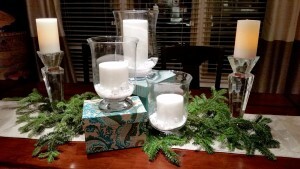 - Decor Designs, Inc.
It’s no secret that the color combinations most often associated with Christmas are red & green or perhaps silver & gold. But, why limit yourself? 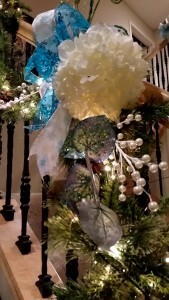 Here are a few pictures from one of this year’s holiday decorating jobs in Lake Barrington. Using our client’s year-round color palette with teal accents as inspiration, we crafted a colorful Christmas using cream, teal and chartreuse green. In addition to the non-traditional color palette, we introduced cream hydrangea blossoms for a bit of a twist. 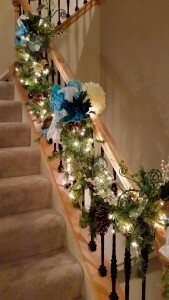 They, along with teal & green poinsettia picks to continue our color theme, served as our floral accents on the tree and staircase garland. The results are anything but a blue Christmas! 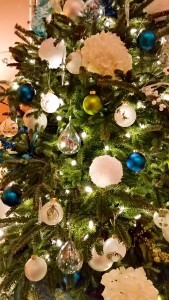 Happy Decorating and Joyous Holidays from Decor Designs! 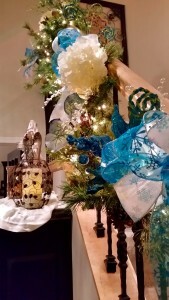 This entry was posted in Decor Designs, Inc. and tagged Holiday Decorating, Interior Decorating on November 28, 2015 by Jeff Rice.